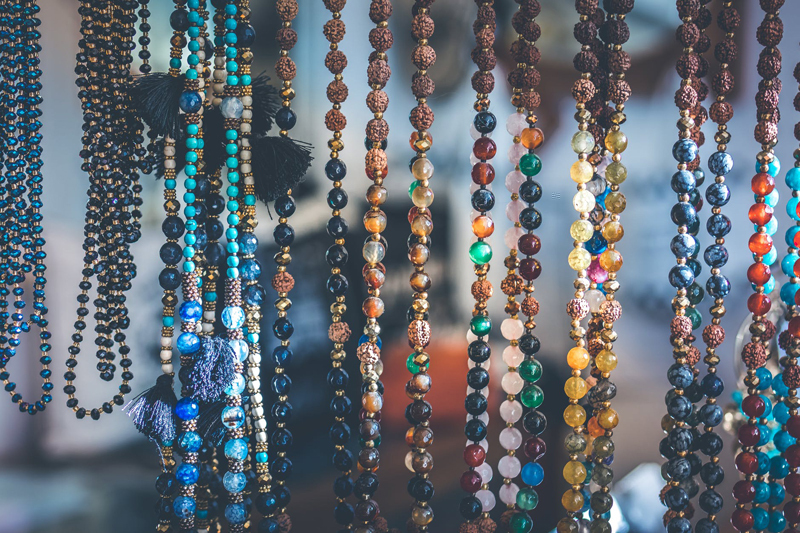 There is no way in this short overview I'm going to be able to cover everything about the art of stringing beads, there are simply too many kinds of cords, threads and fibers to string on, and simply too many kinds of beads. The most common kind of stringing is knotless, strung strands, this seems so simple, but finding the right sense of balance and color for the finished piece is integral. I admit, I hadn't realized how gorgeous stringing could be, until my friend John gave me this necklace. Strung on softflex, with turquoise and copal amber, it really woke me up to the possibilities of stringing. When you string on softflex or tiger's tail you use crimp beads instead of tying knots. The absolute best way to use crimp beads is with crimping pliers. You can find instruction to use them here. Other options for stringing, silk thread, which is commonly used for pearls and other precious and semi precious gem stones, nylon cord in varying weights, leather,wax linen or cotton, or be creative and use silk ribbon, glow in the dark thread,or whatever you can think of! Which brings me to knotting!! Knotting between beads is a wonderful way to make your stringing fiber part of the project, or you can use colored softflex and space out the beads using crimps. This is how people do the delicate floating necklaces, but also I saw a gorgeous knotted strung necklace at a local bead society meeting that just knocked me breathless, it was multi strand with lots of beads, in gorgeous colors, vibrant and bold. Stringing is a wonderful way to showcase a special lampwork bead, or it can look gorgeous in just completely random strands, or elegantly symmetrical. I know one lady who's a wire worker who specializes in copper who uses bead stringing to highlight her gorgeous copper clasps and her very special polymer clay beads. Knotted Silk Necklace from Rings and Things be sure to check out the rest of the projects on this site! Blessed Beads You can get thread, pliers, and some gorgeous lampwork from here. They deliver fast, and are so sweet to deal with! Out on a Whim Beads Gorgeous pressed glass beads! Badger Creek Fly Tying Yes, it's a fly tying supply source, but they DO have glow in the dark thread! Bead Goddess Lynda Graham's Lampwork beads, with a bead of the month club.. won't somebody PLEASE sign me up for that? Drat..guess I need to do it myself.